This may come as a big surprise to some of you, but not all books have pictures in them. Some books just have a whole bunch of words. Over the years, Marvel (and DC) superheroes have made numerous appearances in various novels, and can still be found today sitting right next to Arthur Clarke and Tolkein in the bookstores. This isn't a unique phenomenon. "Media tie-in" novels have been popular for years, with the two most famous lines probably being the extensive libraries of Star Trek novels Star Wars novels. This page will attempt to chronicle the vast extent of superhero fiction over the years. In the late 60's, the very first Marvel novels appeared, including an Avengers novel and a Captain America novel. In 1978-79, Marvel's heroes made a brief return to prose fiction, with 11 books showing up in that brief span, featuring autors including David Michelinie, Len Wein, and Marv Wolfman. Once again, Marvel novels went on hiatus, but when they returned, they came back in a big way. 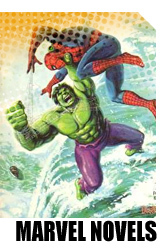 Starting in 1994, a new series of Marvel novels was started, and by the time they were done, they had added FIFTY new works of fiction to the Marvel Universe. Since 2000, Marvel fiction has been somewhat scarce and has come out at irregular intervals. Frankly, it seems as if novelizations of all the Marvel movies have been the main additions. However, starting this year (2005), a new publishing initiative has begun, which promises to once again add to Marvel's literary depth. HEY FOLKS: Check out THIS INTERVIEW with veteran Marvel novel scribe Keith R.A. DeCandido, where he sits down with this website's very own Chris Leazer! ....yer pal in comix, Gormuu! 6. Iron Man: And Call My Killer...Modok!